Instead of doing a bubble watch on Friday, I worked on updating and improving the team pages. You can now click on any team link and find their NCAA at-large odds, updated every morning through the previous night's games. Another cool feature that'll be useful when filling out brackets can be found by clicking on the "MATCHUPS" link on any team's page. That will take you to a report which lists the neutral-site projected score, margin, and winning percentage for that team against each of the other 350 teams in Division I. More cool stuff is coming as I get the time to add it. Since I last looked at the bubble snapshot 10 days ago, the NCAA Tournament picture has continued to crystallize. There are now 42 teams who have earned lock or near-lock status, leaving just 5 bids for the 11 teams with realistic hopes of reaching the Tournament. This bracket was built by hand, but the selections and seeding are all formulaic and based on projections of what will happen, not an "if the season ended today" scenario. 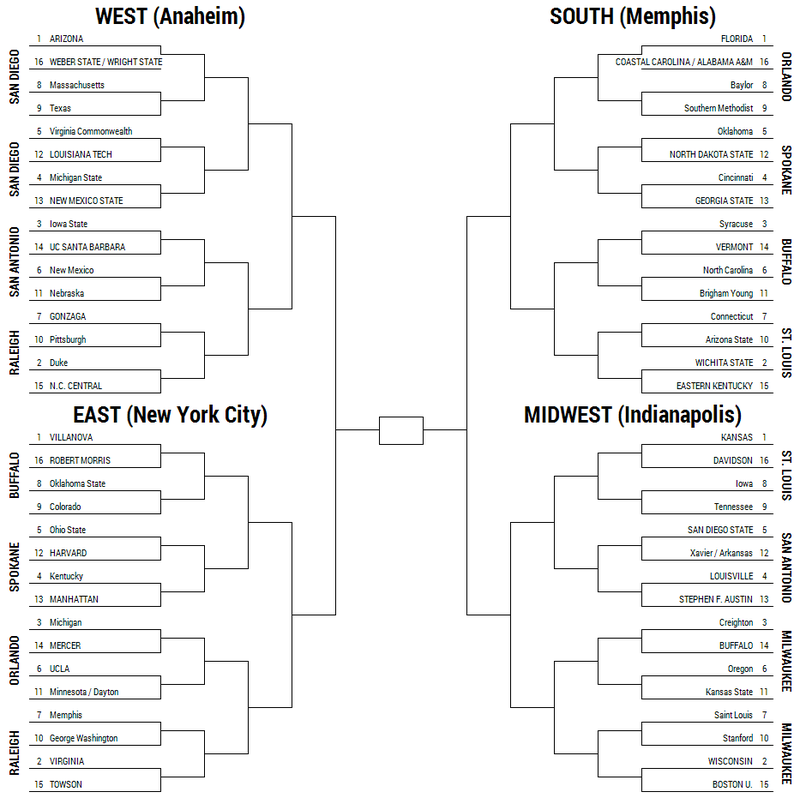 The only team moved off their natural seed line was BYU, who must play in the West or South regions and couldn't be a 10 seed in either Raleigh or St. Louis since those are Friday-Sunday sites; the Cougars are an 11 seed in Buffalo instead, and Pittsburgh moved up to the 10 line. The last 4 teams into the field who won't have to go to Dayton are Arizona State, Kansas State, Kansas State, and Nebraska. The first six teams left out are Missouri, Florida State, Southern Miss, St. John's, California, and St. Joseph's. As long as these teams don't embarrass themselves in their opening conference tournament game (or, for BYU, in tonight's WCC semifinal against San Francisco) they'll be in the Tournament. Nebraska (76%) - With wins over Ohio State, at Michigan State, and Wisconsin and a top-four finish in the Big Ten , the Cornhuskers should be in the Tournament regardless of what happens in their first game of the Big Ten Tournament on Friday against either Ohio State or Purdue. Minnesota (76%) - The Gophers need to avoid losing to Penn State on Thursday evening, and at least give a good showing against Wisconsin on Friday to secure a bid. Dayton (66%) - The Flyers won their last three regular season games--including beating UMass in Dayton and Saint Louis on the road--to claw their way back to the right side of the bubble. A win over Rhode Island on Thursday should put them there for good. Xavier (57%) - The Musketeers are probably going to Dayton regardless of the outcome of Thursday's Big East Tournament opener with Marquette. Arkansas (48%) - A little bit of the shine came off the Razorbacks' big win at Kentucky when the Wildcats went out and lost their next game at South Carolina, and the Hogs didn't help their case much when they lost by 25 at Alabama to close out the season. They're my last team in right now. Missouri (30%) - In what may well have been an NCAA Tournament elimination game, the Tigers got run out of the gym at Tennessee on Saturday. They'll need to win a couple in Nashville if they have any hope of playing in the big Tournament. Florida St. (26%) - The Seminoles could have removed all doubt about their NCAA Tournament status by beating Syracuse at home on Sunday, but they couldn't pull the upset. Now they'll have to beat Maryland on Thursday to earn a crack at Virginia on Friday. Southern Miss (24%) - The Golden Eagles probably need to win the Conference USA Tournament to receive a bye. Should they lose to Louisiana Tech in the semifinals, though, they'll need to hope that this committee is one that values their mid-30s RPI over any rational objective standard and gifts them a bid. St. John's (21%) - The Johnnies saved their season by salvaging a double-overtime win at Marquette on Saturday, but they'll have to reach the Big East Tournament finals to earn an NCAA bid. California (19%) - An overtime win over Colorado on Saturday kept the Bears in the conversation for an NCAA bid, despite losing four of their last six games. They'll have to beat the Buffaloes again on Thursday and beat Arizona on Friday in order to earn a bid. St. Joseph's (18%) - The Hawks played over their heads for the entirety of February, but gave back most of what they'd gained in back-to-back losses to GW and LaSalle. They'll need to do some serious work in Brooklyn if they're to earn a bid. Georgetown (11%) - The Hoyas probably need to win the Big East Tournament to receive an NCAA Tournament bid, but there's a chance that if they lose in the championship game and everything goes wrong for the teams above them on the list, they'll get a trip to Dayton.